For millions of women in developing countries, the simple act of preparing a meal is a hazardous activity. Every time they cook on a traditional wood, coal or animal-dung stove, which is to say a couple of times a day, their homes are filled with toxic by-products such as benzene, carbon monoxide and formaldehyde. Little wonder that such stoves are blamed for killing 1.6 million people every year, more than 85% of them women or children under 5. Traditional stoves are also highly inefficient, and their soot is second only to carbon dioxide emissions in speeding up global warming. Which is why when Nathan Lorenz, 31, and Tim Bauer, 32, of Colorado State University learned about those problems, they knew they could help. In 2003, the two founded Envirofit, a nonprofit that uses their research into clean two-stroke-engine technology to create greener auto-rickshaws for Southeast Asia and India. Their expertise, they realized, could be applied to stoves. "When you visit these countries, you know that people should not be dying just because they're cooking breakfast," says Lorenz. Envirofit partnered with the Shell Foundation charity and in 2008 introduced a range of virtually smokeless stoves that since their launch have helped thousands of families in India breathe easier. The stoves will soon be available in more than a dozen developing countries across Asia, Africa and Latin America. Engineered to burn poisonous fumes and particles before they escape into the air, the stoves reduce toxic emissions by up to 80% and fuel consumption by some 60%. Light, durable and made from fire-resistant alloy, they cost between $17.50 and $55.60 each  not cheap by the standards of a poor family in the developing world, but the fuel savings mean the stoves pay for themselves in just six months. 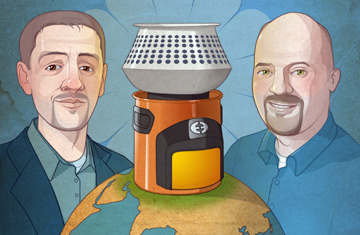 Smokeless stoves are nothing new, of course. There are dozens of safer cookers provided by aid groups or NGOs, and any number of their designers are worthy of the green-hero accolade. But we like Envirofit's philosophy that a good-looking, well-made stove is more valuable if it costs a little. "We want our products to be something the owner is proud to have at home," says Lorenz. "When they buy it, they use it. It's a conscious choice." One that not only saves lives, but helps our planet as well.